Complete Entertainment Exchange (CeX) is a UK-based store that puts up second-hand goods like gadgets and game devices for sale. We love this store for its extensive collection of game discs. CeX in Next Galleria Mall is full of devices and discs that'll excite any gamer. Check out unboxed or preloved iPhones, laptops at whopping prices. But if you're looking for something more interesting like a Nintendo Switch, and consoles like 3DS XL PSP Go, you will find them too. We found an unboxed version of 3DS XL Zelda at INR 8,000 and Kinect at INR 7,000. Love your Xbox dearly? Take your pick from the piles of gaming discs. In fact, one side of the store is entirely dedicated to discs where you can find not just Xbox but PS3 and PS4 too. The prices range from INR 50 and upwards. Grab Batman: Arkham Nights at INR 1,200 or FIFA 17 at INR 1,400. Go nostalgic and get NFS Most Wanted and grab that disc of The Last Of Us at INR 900. 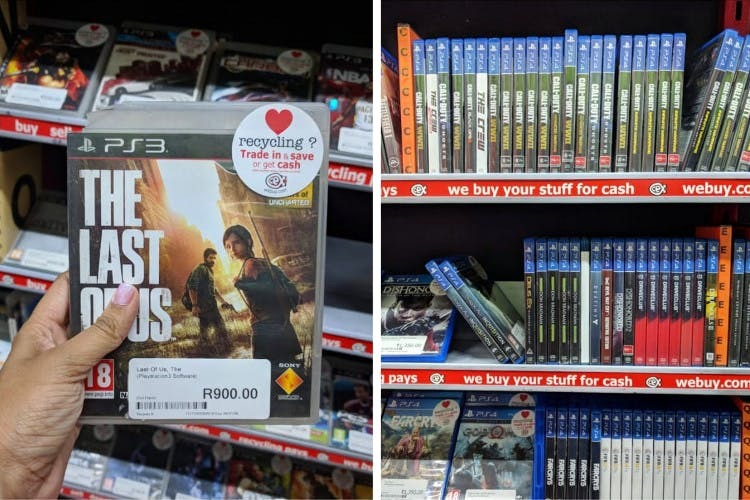 Plus, you can trade in your old games for whatever game you like at the store. PC gamers, there is hardly anything for you here in the form of games. Got a gamer friend you'd like to gift some games? Buy a gift card from CeX and send it to them. Also, CeX has another outlet in Forum Mall and it boasts of an even extensive collection.